The photo is taken at The Rectory in Worthen in about 1902.The organization was founded in Worthen in about 1843. They usually had their meetings at the Kynaston Arms, indeed the Worthen lodge was called the 'Court Kynaston Lodge'. There were several other types of friendly society in the vicinity at this time e.g. Brockton Friendly Society [founded c1814], the Order of Druids Friendly Society, Brockton Oddfellows Club. These societies controlled various property in the locality. For example, in 1913 13 acres belonging to the Druids were being farmed by Joseph Lee, 8 acres by Joseph Lloyd. The Forresters owned the house at the top of Worthen bank, which in 1922 was being lived in by Edward Benbow and his family. In the 1980s Edward Benbow's son, also Edward, wrote a series of vignettes in the magazine 'Shropshire Unfolded' about village life here in the 1920s and early 1930s. He refers to Worthen as 'Enworth' and Brockton as 'Stanton'. 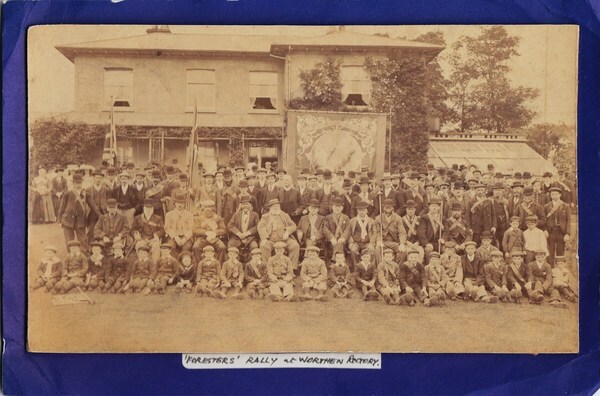 There is a report in the Montgomeryshire Express and Radnor Times of June 14th 1892 of events on the annual anniversary of the Court Kynaston lodge of the Ancient Order of Foresters. This involved a service in the church, where the rector’s absence was both noted and regretted, and celebrations at the Kynaston Arms. The report notes that they then had 357 members on their books, and that in the past year they had made the following payments: £47 in old age pay [to 6 members], £348 in sick pay [to 101 members], £80 in funeral allowances [8 members], £10 funeral allowance to members’ wives [2 cases] and £81 on medical attendances. Their income for the year was £637-2s-8d. The photo above is probably of the anniversary, on which occasion both senior and junior members of the lodge would 'muster'.